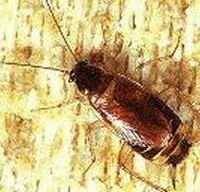 Get a Quote for Cockroach Control Services Now! 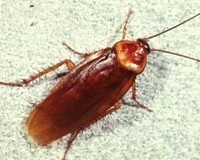 American cockroach is also commonly known as the “water bug”, and often misidentified as the “palmetto bug”. An American cockroach has the ability to grow around 4 cm in length and 7 mm tall. They are typically red-brownish in color with a yellowish stripe on the body region behind its neck. The cockroach is divided into 3 sections; 1. Body is flat with and oval shape, with a shield like covering to protect the covering of its head. 2. A plate like structure called a “pronotone” covers all parts of the dorsal of the pest. 3. They have long segmented antennas with four wings with elevated hind wings. They insect can travel quite rapidly, and can be found in small cracks, and under doors. 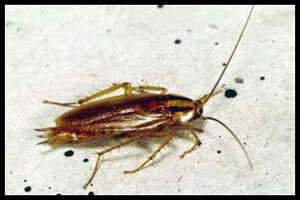 This common roach is considered to be one of the fasted running insects. Cockroaches can pick disease caring bacteria which in cause can easily be deposited into food causing food poisoning and salmonella. They feed on a number of materials such as, cheese, leather, beer, bakery products, old starched bindings in old books, hair, plant material, etc. The American cockroach has developmental stages; e.g., nymph, adult. Females produce an egg case and after approximately 2 days, the egg casings are placed in a safe protected area. The eggs are brown in color and are purse shaped. The roaches then hatch from the egg cases about 6-8 weeks after being placed. It then takes 6-12 months for the roaches to fully mature. 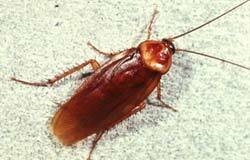 Adult roaches live up till a year, in which that year, they mate and reproduce. Large infestations of these insects are usually not very common in homes, due to the large size and slow development. 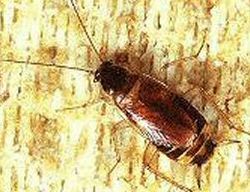 Although cockroaches do need warm conditions to grow and be able to reproduce them usually migrate into homes over the fall and winter season. This can be controlled by a pesticide professional by using an insecticide powder. 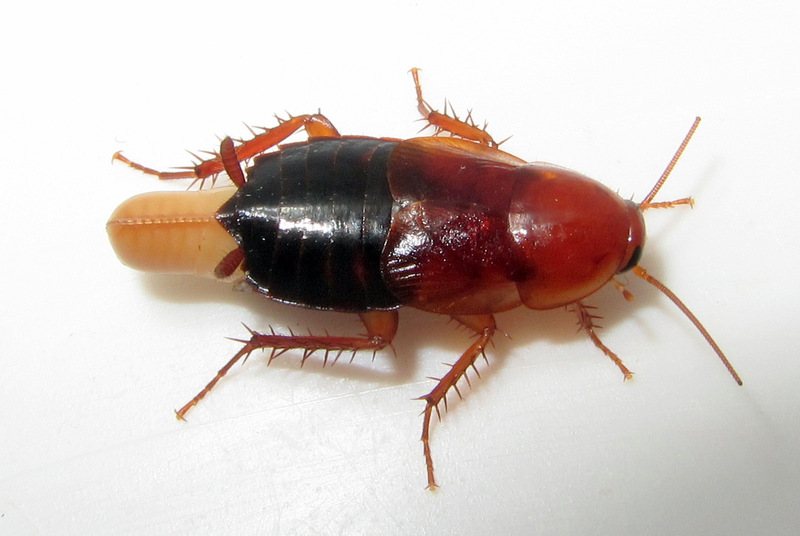 It’s also within a homeowner’s best interest to cover any kind of small cracks or cervices that this cockroach would be able to merge through. The German cockroach is the smallest species of the cockroach family, measuring 1.3-1.6cm in length. They are usually brown, tan or almost sometimes black in color. They have two dark parallel stripes running from the head of the body all the way down to the base of their wings. They are unable to fly, and often located in restaurants, food processing facilities, hotels, and nursing homes. They are nocturnal, however can been seen during the day. They also have the ability of giving off an extremely unpleasant odour when frightened, threatened, disturbed, or even excited. The German cockroach reproduces significantly faster than any other type of roach. From egg to a sexually mature adult it takes approximately 123 days. Due to the fast reproductive cycle of this specific type of roach, pesticide methods must kill of 95% of the overall population. This type is so small it is easy for them to get into smaller crevices and crakes and remain hidden from most insecticidal surface treatments. This is why the us of bait is part of the procedure. The roach will locate the sweet smell of that bait which will causes the roach to crawl through the insecticidal powder which is then brought back to the nest and they eventually die off. A couple treatments may be necessary to ensure full removal of these insects. The oriental cockroach, also known as “the water bug”, measures about1 inch in length when fully matured. They are dark brown, or black in color with a glossy body. The female appears wingless but has two short wings just below her head that serve no purpose. Females are also a little wider than the male. Males have longer wings, which cover majority of their bodies, these are usually brown in color. Some males (not many) are capable of flight. Theses insects are also known as water bugs due to the fact that these species prefer damp wet spaces, such as, sewers, drains, damp basements, and around matter that is in the process of decay. Matured adults are light brown in color, and have two yellow/brown stripes lining the body. There is a segment located behind their head that is dark brown in color and serves as a shield. Females are often darker in color and broader, much like the mud roach. They are approximately ½ inch long. The female roach is capable of producing 14 egg capsules, which contain around 14-18 eggs each. Nymphs emerge about 70 days after, and molt 6-8 times before becoming an adult. Adults only have a life span of about 6 months. 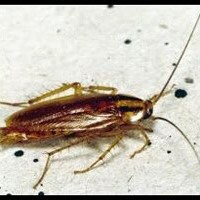 These types of roaches are commonly found above ground level in warmer temperatures. They can hide behind pictures, other wall décor, and appliances. There are many methods to rid these pests from your home, but is advised that a pesticide professional come and remove these for you as the powder use can be extremely toxic if inhaled.